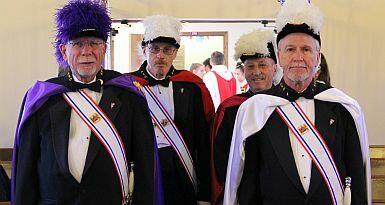 Welcome to the web page of the Knights of Columbus Council #9518 of St. Gerald Catholic Church in Ralston, Nebraska. We invite all practicing Catholic men of our parish age 18 and older to join our ranks and take a more active role in their faith. To keep up with the latest information from our council, please visit our Facebook page. For general information about the Knights of Columbus, please visit the Knights of Columbus website. Click here for additional information on upcoming events. Generally, our council meets the 3rd Thursday of every month at 7 p.m. We start our meetings with either a mass or communion service in the 96th & Q Street adoration chapel. All members are invited to attend our general meeting. Council #9518 was chartered in 1987 and is named after Fr. William A. Foster. We are affiliated with St. Gerald Parish in Ralston and many other organizations within the Ralston & Omaha metro area. We started our Council with 46 charter members with the first Chaplain being Fr. William A. Foster and the first Grand Knight, Jim McNamara. Charity, Unity, Fraternity and Patriotism are the cornerstones of our Order which focuses on active involvement by our members in the areas of church, community, council, family and youth. There are over 2,600 families at St. Gerald Parish. We currently have a nice mix of younger and more seasoned members which has given our council a wonderful balance of energy and character. With all the Family, Youth, Service, Parish, and Community Activities that we sponsor every year we believe there are many reasons to join Council #9518. Donated over $11,500 to various other church and community charities; i.e. St. Gerald Capital Campaign Fund, St Thomas More Society, Siena Francis House, KVSS Spirit Catholic Radio, St. Gerald Rosary Group, Global Outreach, Chesterton Academy, KC Charities (Middle East Persecuted Christian Fund) and Tri-City Food Pantry. As part of our effort to grow our Parish Family Life and deepen all of our Faith, the Knights are proud to announce that we have booked a weekly Holy Hour of Adoration reserved for Brother Knights and their families and friends. The goal of this hour is to help strengthen our council, parish and families through conversation with Jesus. There is no formal agenda or program for this hour. Depending on the number of attendees, please feel free to join in a group Rosary or simply remain in silent prayer. Additionally, this is a fantastic way to spend the 3rd Thursday of each month and then stay and join us for mass and our monthly meeting. We look forward to worshiping with you and your family! The Knights of Columbus offers men a place to lead their families and communities in faith and service and put their Faith into Action. Knights of Columbus members, parishes and families have the opportunity to make a meaningful difference through 32 Supreme Council-recommended programs. Organized into Faith, Family, Community and Life categories, the Faith in Action program model empowers Knights to come together to share faith, celebrate fraternity with loved ones, and do what they do best - stand shoulder to shoulder in service to the community and to defend life at all stages and in every condition. Grow in faith and build a strong parish and Church. Aid priests and religious in formation, honor Mary, mother of God, and engage in serious spiritual reflections and religious education activities. Strengthen families through faith and service. Socialize and pray with other faith-filled Catholic families through special events, religious services and volunteer opportunities. Make a powerful difference in your community. Help those less fortunate with the basic human needs of clothing, shelter, mobility and compassion. Create a culture of life. Assist pregnant women in need, care for the elderly, aid the handicapped and empower those with special needs to realize their full potential. Visit the United States Conference of Catholic Bishops website and read today's mass readings, or listen to the readings by clicking on the play button below. Click here for a calendar of upcoming events. By purchasing gift certificates to various local vendors at no additional cost to you, you support our educational programs including 5 Day School, Family Formation, Youth Ministry, Adult Education, and the Parish Library. Click here to reserve your HOPE certificates online now. Looking to spend some more time with scripture? Follow a daily bible plan and read the entire bible in one year! The parish office maintains information on our registered parishioners. Please take a moment to submit your information so we can update our records. If you are not yet registered at St. Gerald, you are invited to register now. ©2019 Saint Gerald Catholic Church, all rights reserved. For questions about St. Gerald Catholic Church, please contact the parish office. Contact the Webmaster with comments regarding our web site.